This is by far one of the best anime series I have ever watched. Seeing it back in the late 1990’s was my first introduction with the original Dragon Ball. My brother and I started watching this anime together and became addicted! 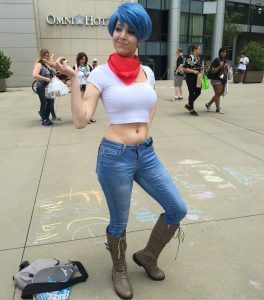 Bulma is a female character that has been around since the original dragon ball. She has a very strong mind and attitude which makes her the odd match for Vegeta. Though out the series she has many different outfits so I decided to go with the most popular ones I found. The bunny outfit is the one Master Roshi has a obsession for hehe! This cosplay of Bulma’s bunny outfit is spot on and looks amazing she is even holding the 3 star dragon ball! The wig color matches perfectly to what I would expect Bulma to look like in real life. 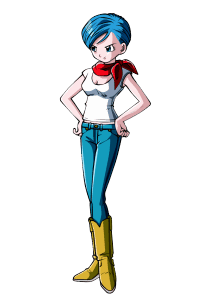 Bulma was forced to wear this outfit when it was the only thing clean and in her size. 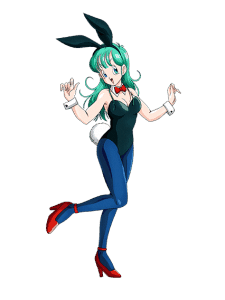 It actually came from Oolongs house who has the ability to shape shift and has even turned into Bulma wearing the bunny outfit. Later in DBZ Bulma gets a hair cut and keeps her short hair for quite some time. This outfit is when she is working at capsule corp and is helping Goku get to Planet Namek. This is the outfit she wears when she is getting done up. I think in one of the episodes they throw a party back on earth and she wears this red dress. As one of Goku’s first friends Bulma is quite smart being the daughter of a scientist. She follows in her dads footsteps by creating all sorts of cool gadgets thought the series. 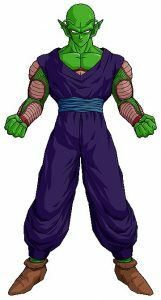 Piccolo is one of the main villains in dragon ball that Goku must defeat. Later in dragon ball z they become friends. 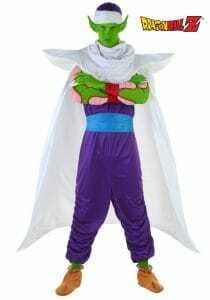 Piccolo also trained Gohan while Goku was away in the after life. 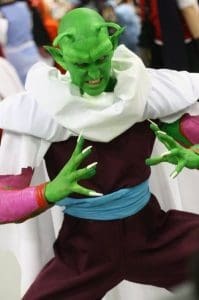 This picture of Piccolo is when his hat and shoulder pads are taken off during combat. 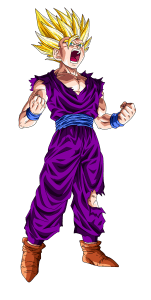 You may notice that Gohan wears the same outfit as Piccolo. 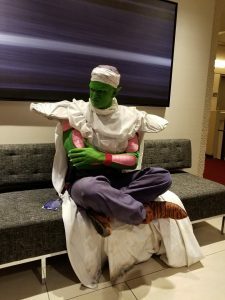 These are some of the best Piccolo cosplay I found, the first picture is the dragon ball z cosplay costume that can be bought at most cosplay shops. The cape of the middle Piccolo looks the best you can see it is made of a much heavier material. 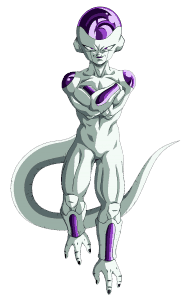 Frieza is a interesting character since he and Vegeta go back in history and are enemies. 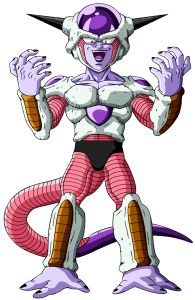 Since Frieza is basically pure evil and wants all the dragon balls on planet Namek to gain even more power. The form you see with the spikes coming from the sides of his head is actually his first form and the one on the right his last form you see on Namek. Frieza has quite a few different transformations golden and metal Frieza are two other forms he comes back as though out the series and movies. 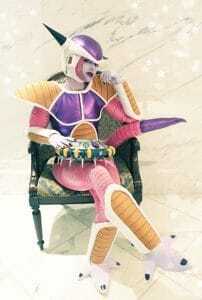 The above Frieza cosplay is of his first form before he seen any battle still wearing his saiyan armour. The head piece looks perfect and the colors are just like from the show, make up and finger nails done perfect as well. In the 2nd picture you can see they have the tail sticking out from the side of the chair as Frieza holds one of his gadgets thinking. 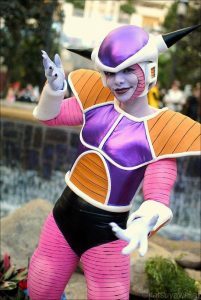 I am not sure if this Frieza cosplay costume was bought at a store or hand made but it came together great. Metal Frieza appears in one of the dragon ball z movies when a bunch of villains from the past are revived. This costume looks great someone put a lot of work into it and getting everything to come together. He was rebuilt with a lot of armour pieces and scrap metal somehow! Gohan is Goku’s oldest son and plays a big roll in some dragon ball z battles. He becomes a super saiyan at a young age and is also trained by Piccolo. This is why he wears Namek clothes and is seen with Piccolo a lot. Later in the dragon ball z series Gohan changes his style to his fathers. 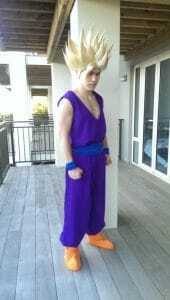 Then again to his own “Saiyan Man” costume. 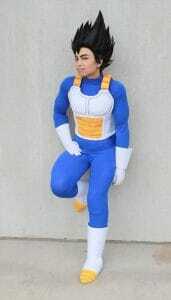 The Saiyan Man costume is just Gohan going around as a super hero. This is so he can do good for the town and people will not know who he is lol. 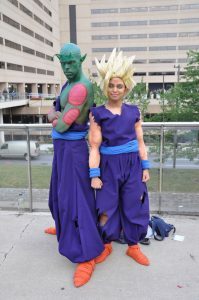 Super saiyan Gohan standing with his trainer Piccolo. The ripped clothes from fighting or sparing adds to the look and the height of Piccolo and the person cosplaying as Gohan is perfect. The Gohan on the right looks a bit to tall but the cosplay costume is awesome the purple clothes and hair look great. Not sure how they go about getting the hair like that but I am pretty sure cosplay shops sell it all ready looking like that. Does he really need a introduction? 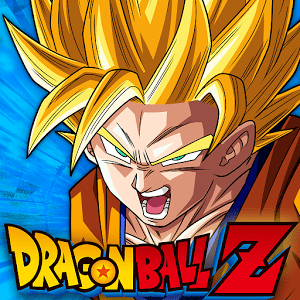 This is Goku the poster child of all the dragon ball franchise! Goku is the representation of pure good all he wants is to protect planet earth and his friends. The first time we see a super saiyan is with Goku thought out the anime he is always pushing himself to reach new levels in his training before anyone else. Due to his kind nature Goku becomes friends with so many different alien races and in return some of them teach Goku new techniques like instant transmission to name one of them. 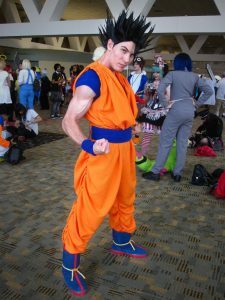 The Super Saiyan Goku Cosplay looks amazing it reminds me of the battle with Freiza on planet Namek. Being pushed to his limits he is able to reach super saiyan status. 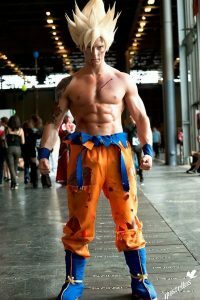 The guy cosplaying as Goku has the same type of body as the real Goku super muscular! The only thing throwing it off is the arm sleeve tattoo :P. On the right you can see normal Goku wearing his traditional martial arts outfit from Master Roshi. 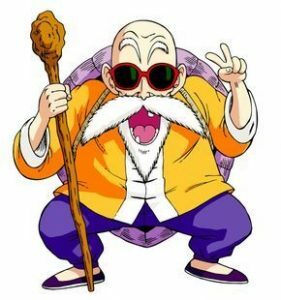 Hey look its Master Roshi that old pervert who lives on a small island called turtle island. He happens to be the strongest human on planet earth haha :). This is the man who invented the Kamehameha and in the original dragon ball series meets Goku. Then he takes him under his wing. Master Roshi trains and raises Goku teaching him how to use the Kamehameha. Together they end up going to many tournaments and battles! Master Roshi has a strong attraction to females thought out the anime. Getting the “noose bleed syndrome” when he meets a pretty female character or Bulma for that matter in the early days haha! 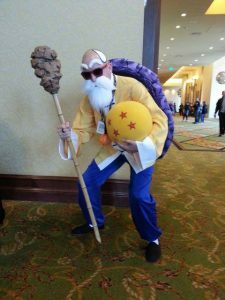 This is probably the best Master Roshi cosplay that I have ever seen. This guy looks just like him and has the muscles to pull it off as well. 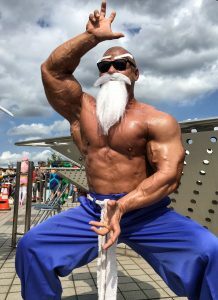 When Master Roshi gets ready for battle and starts to power up he gains a lot of muscle. No longer looking like a skinny feeble old man. Who ever took the picture did a awesome job you can see him getting ready to do a Kamehameha. You can see in the other picture him using his Kamehameha at the camera pretty cool. When Master Roshi is not fighting you will find him back at turtle island were he lives. This cosplay is awesome because it has his staff and turtle shell. Holding the 4 star dragon ball adds to the dragon ball z costume. Spotted stealing the dragon ball Master Roshi has some sweat rolling down his head! These shades that they are wearing have the red on the sides just like in the anime I dont seem to notice them like that in the other cosplay costume. 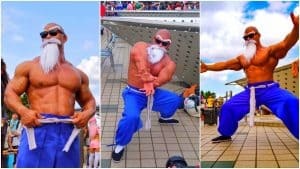 Who would of thought there would of been so many Master Roshi cosplays out there for some reason I thought it was pretty cool! The first major bad guy we see in dragon ball z is Raditz. This is wear we learn that he is a saiyan like Goku. 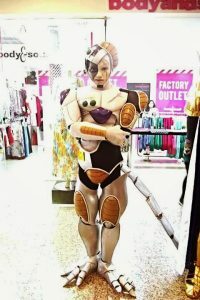 When searching for dragon ball z costumes I wasn’t sure if their would be much interest in Raditz cosplay but there is. 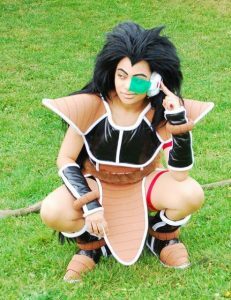 Surprisingly there are a lot of female Raditz cosplayers which is cool must be the long hair. Raditz is so strong that it brings Piccolo and Goku together to try and beat him even though at the time Piccolo does not trust Goku or see him as a friend. 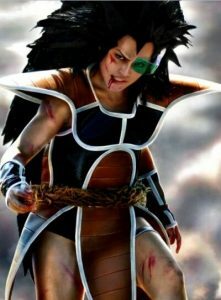 So these are some of the best Raditz cosplays I came across while searching online. The first is of a female Raditz charging energy in her hand. She has a very realistic background and expression which is why I choose that picture. The middle Raditz has a lot of photoshop edits done to it like a cross between anime and real life if that makes any sense. The last picture of him sitting down on the grass is pretty cool. The wig looks just like Raditz hair and same with the outfit. This is personally my favorite dragon ball z character of all time! Vegeta comes not long after Raditz visit to earth looking for Raditz and instead encounters Goku and his friends. Vegeta is a very emotionless person and kills others with out hesitation. During the battle on earth Goku gets to see Vegeta transform using his tail into the giant monkey form. Later in the series Vegeta and Goku become rivals. Always training and trying to be stronger then the other and Vegeta settles down on earth and finds himself a wife Bulma. 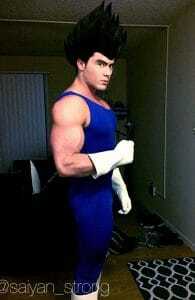 These are some Vegeta cosplays that look pretty good. The first is of when Vegeta first landed on earth you can see he still has his tail. Another clue is that he is wearing the same red scouter he used on earth. The middle Vegeta looks the best and the one we get to know from later in the dragon ball z series. The last is when he has his chest armour off and is powering up since the bigger muscles haha. The middle cosplay is by far the best sorry guys! The hair is just like from the anime and so is the costume also the persons body size is just like from the anime.